One of childhood's simple joys for many of us was getting our creative juices flowing by playing with building blocks. It's one of those tactile, imaginative outlets that adulthood features far less of. Blocks also brought the added benefit of getting to destroy the work you'd built – a task similarly delightful to the actual building. Recently my wife and I were babysitting twin 1-year-old boys, owners of a big bucket full of colorful, cardboard bricks. All throughout the night I enjoyed building small towers with the bricks, and the boys would have a blast knocking those towers down. Even when they were on the other side of the room distracted by something else, if they saw me stack three or more bricks together, they'd quickly come running to play demolition crew. 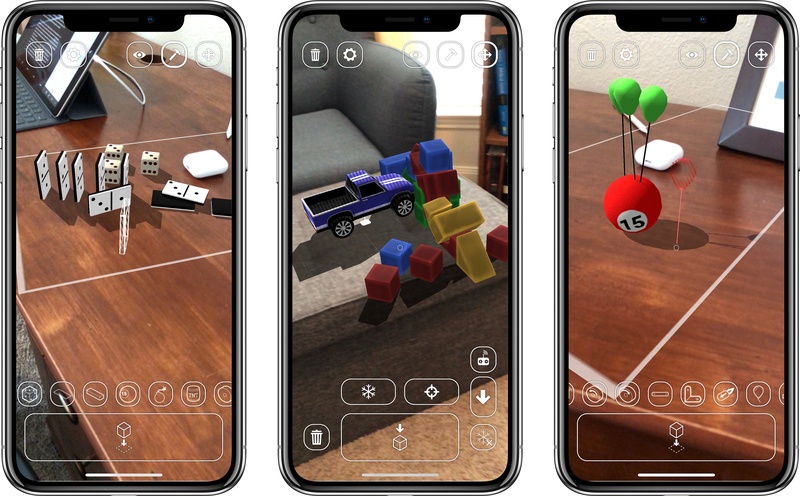 Playground AR is a new app from developer Marc Sureda that uses ARKit to bring the joys of childhood play to all ages – and with no mess to clean up either. The app provides a variety of toys that let you both build and destroy, with a physics system backing it all up to make the experience a delight. There are three main modes in Playground AR: one is for placing objects in your playground, another lets you better survey and capture photos of what you've built, and the last is for picking up and moving existing objects. Objects you can place of course include blocks of varying shapes and sizes, but there are also lots of other fun, interesting toys to experiment with – trucks, helicopters, dice, spinning widgets, and more. The physics engine is what makes Playground truly shine. Stacking blocks too high, for example, will cause your creation to topple over if the stack isn't well-balanced. Dominos can be strung together in an elaborate setup then knocked down by a rolling ball. Magnetized blocks will stick together even if gravity or another object forces them to fall. Balloons can be attached to objects, and depending on an object's weight and the number of balloons, the object will eventually be sent flying into the stratosphere. But I would be remiss if I didn't mention my favorite physics demonstration: placing bombs and TNT containers in your playground to blow everything up. It's brilliant. If you want to spend some time goofing around in an AR sandbox, building and destroying in all kinds of creative ways, you can pickup Playground AR on the App Store for $1.99.